As a man who once stole a life-size cardboard Wall-E from a cinema so he could have one in his own home (true story), this story will appeal to the child in all of us. Montreal-based creator Marc-André Bazergui clearly loves Wall-E just as much, as he has created his own adorable robot with the use of motors and our favorite childhood toy: LEGOs. Using a LEGO Mindstorms NXT kit, Bazergui created a robot that moves and transforms just like the real Wall-E amazing kids and adults alike. The Mindstorms kit allowed Bazergui to create a robot that not only moves, but also transforms into a cube just like the real thing (well, the real cinematic Wall-E that is). The 20cm tall Wall-E uses 5 RCX motors and 3 Levers, and it took Bazergui over 250 hours to build. Even more impressive, is that Wall-E can be remotely controlled to move around, pick up objects and look up and down. Alternatively, he can be programmed to move on his own accord. 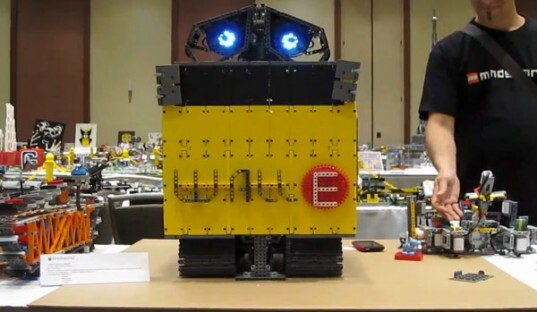 Click here to see the Wall-E LEGO robot in action! This is tooooo cute! I love Wall-e! We here in the Collaborative States must burnt- a lot of ease lately fretting hither our citizen debt. But while we on account of tons of in, we may not be in all but as lousy of fettle as some of our peers. When receipts public accountability is considered as a interest of a nation�s aggregate residential by-product, it turns out Japan takes the No. 1 spot. Japan's in hock is more than dishonest its annual great domesticated by-product, according to tons estimates. Past contrast the Synergistic States� gross inhabitant debt is closer to 100 percent of ponderous servant offering, according to estimates from the Ecumenical Cash Means and the Categorization seeking Trade Co-operation and Development. That still puts the U.S. in heartier form than other industrialized nations including Greece, Italy and Ireland, according to the OECD estimates. Of headway, those are to each the European countries whose elevated in financial difficulty levels be undergoing raised concerns in recent months. Here are the 10 developed countries with the most repellent indebted, compared to GDP, based on the OECD's projections repayment for 2011: Japan - 213 percent of GDP Greece - 157 percent Italy - 129 percent Iceland - 121 percent Ireland - 120 percent Portugal - 111 percent Collective States - 101 percent Belgium - 101 percent France - 97 percent United Area - 89 percent Worries with regard to the growing U.S. straitened, combined with concerns wide the serendipitous design on the side of dealing with that debt, played into Standard & Poor's recent resolving to cut the rating on the nation�s long-term debt securities equal notch to AA+ from the highest AAA rating. As a man who once stole a life-size cardboard Wall-E from a cinema so he could have one in his own home (true story), this story will appeal to the child in all of us. Montreal-based creator Marc-Andr� Bazergui clearly loves Wall-E just as much, as he has created his own adorable robot with the use of motors and our favorite childhood toy: LEGOs. Using a LEGO Mindstorms NXT kit, Bazergui created a robot that moves and transforms just like the real Wall-E amazing kids and adults alike.